This is my first ‘big’ decoupage project. 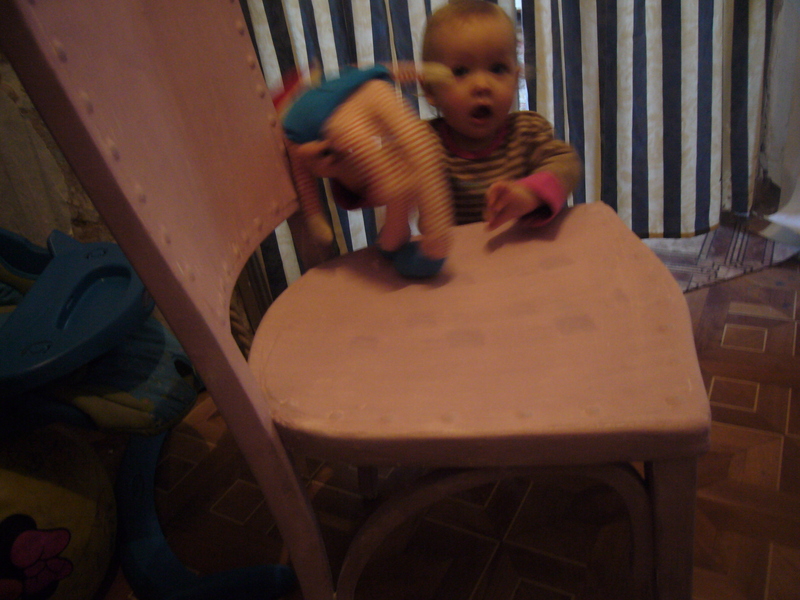 I had a very old and shabby chair. So, I thought: how about some shabby chic? Here is what came out of it. Here is my little decoupage how to step by step project. I forgot to take a photo of this chair before I started on it. It was ugly and brown with many cracks in the wood. I had to use up lots of wood putty on it. Then I painted it with white acryl paint. I had to do it over for the second time. Once the putty and the paint dried up, I applied sandypaper to it to even up. 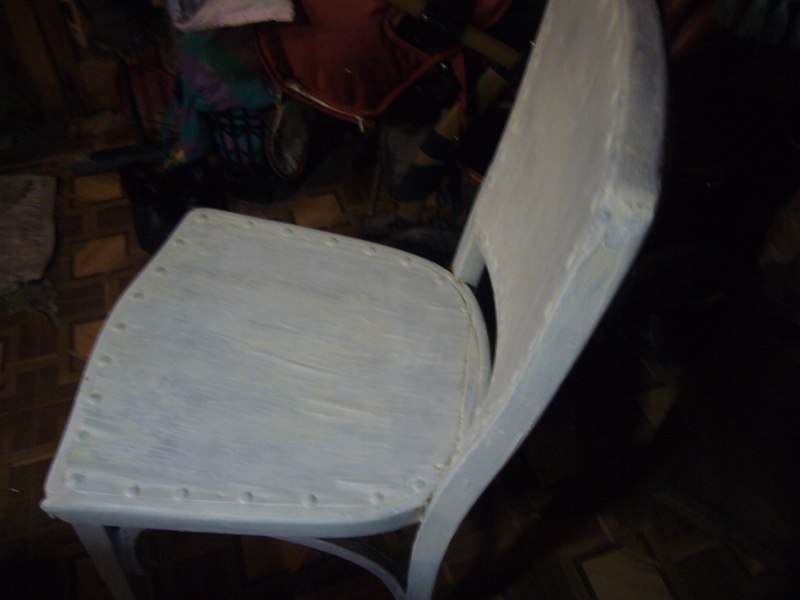 Then, I have applied more putty to the wood and repainted it into white color again. Then I took a candle and rubbed it on the chair sit and ‘ribs’. Remember, I wanted to attain shabby chic effect. If you rub the candle on the wood and then paint it, you can easily scratch off the new layer of paint and get the under layer come off. Here I have painted it for the third time. This time I used pink paint. You can see my little helper here. 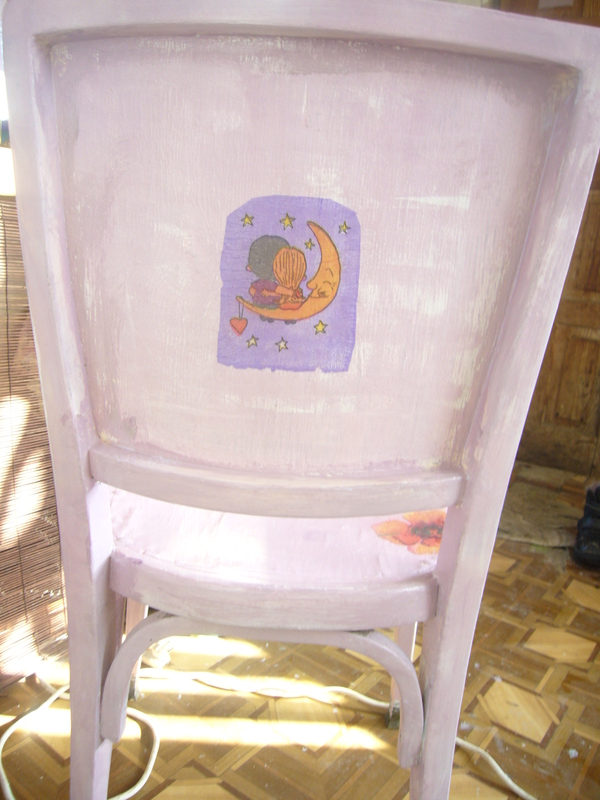 Once the paint dried up, I used sandpaper to scratch some of it off and produce that shabby chic design or effect. I could not take good enough picture to show it. Here we come to decoupaging. I used flower pattern napkins. 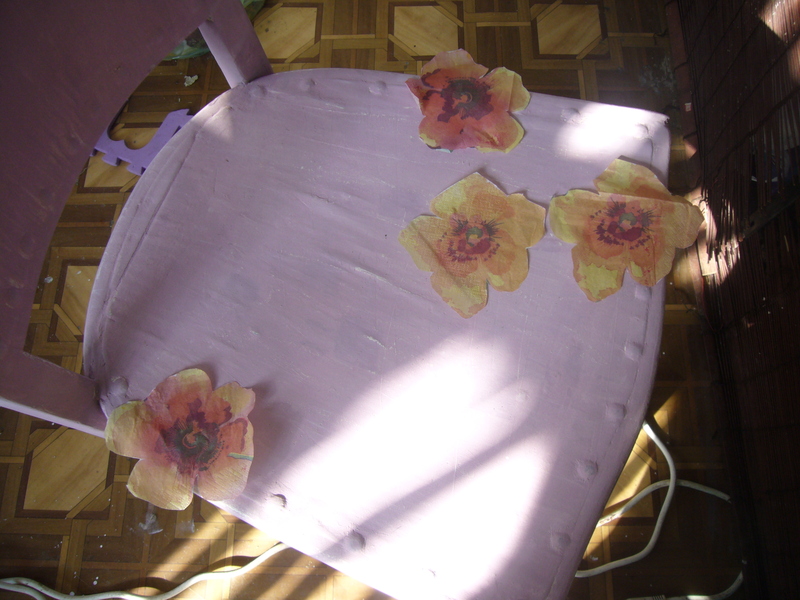 I cut out the flowers and tried out different ways of placing them on a chair. First I tried decoupaging an old piece of wood. I tried using glue for it, but it did work well for me. I could not get all the air out and the flowers would go wrinkled. Then I used colorless furniture polish for it. It works just fine. First I apply little bit of polish to a place, where I want to place my decoupage picture. Then I stick the flower on to it and apply thick layer of polish on the top of it with a soft brush. Here is what I got. I applied polish several times to the flowers. I also covered the entire chair with it, as I plan to use it outdoors. 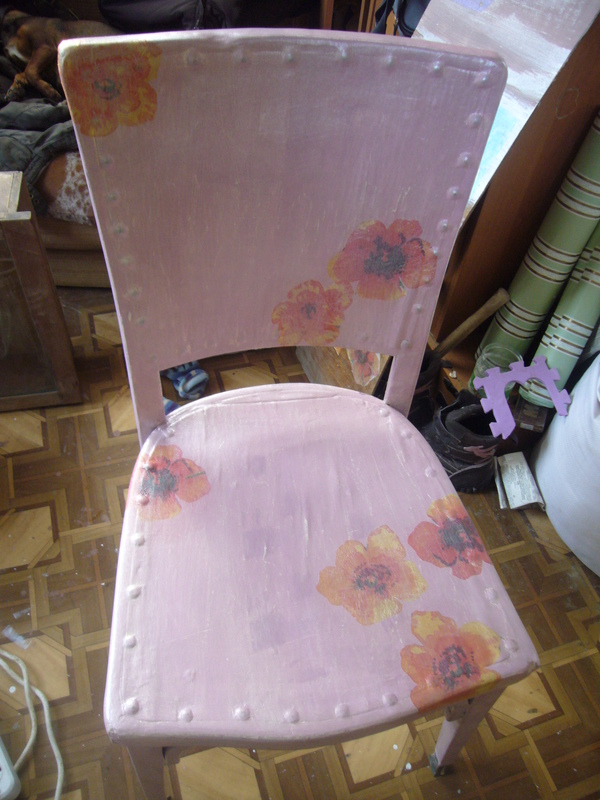 I had some gloss transparent polish, so I used it on the flowers and the chair sit as well. The back of the decoupaged chair. You still cannot see well the shabby chic effect on my pictures. Believe me, it is there. 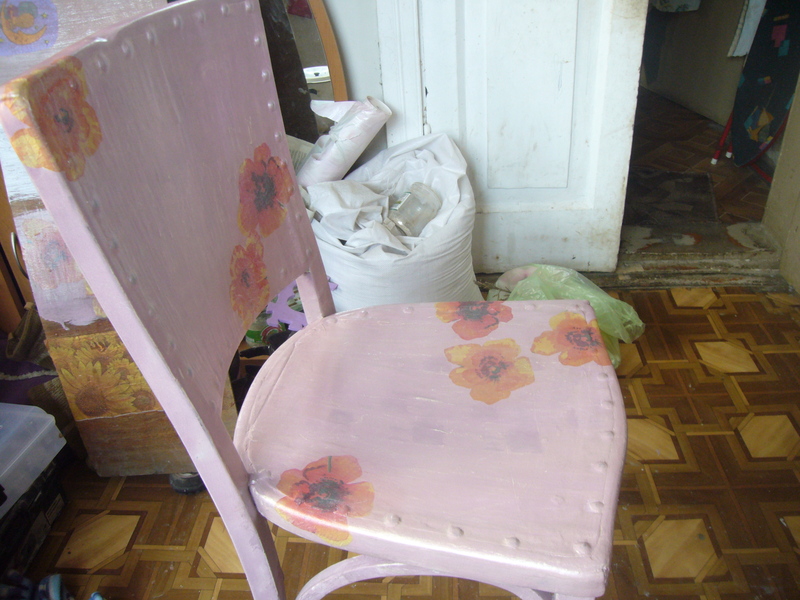 This entry was posted in Uncategorized and tagged chair decoupage, chair restoration, crafts, decoupage, decoupage how to, decoupage photos, decoupage tips, decoupage workshop, design, furniture, home decor, home design ideas, how to decoupage, old chair, shabby chic, shabby chic chair. Bookmark the permalink.